Automatic shut down with Handbrake! If you don't like to leave your computer running all night but want to take advantage of this time where your processor is 100% idle to re-encode video, a great feature in Handbrake is for you. It also lets you do a whole lot more. 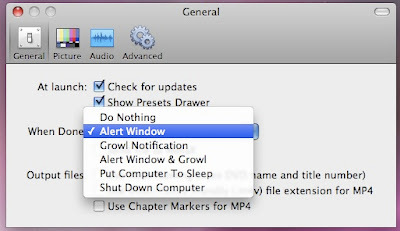 You can choose specifically what you want Handbrake to do after the encode is over (sleep or shut down your computer). It will even let you switch to a Growl notification instead of the usual "Put that cocktail down.". It is located in the Handbrake preferences, under "When Done". 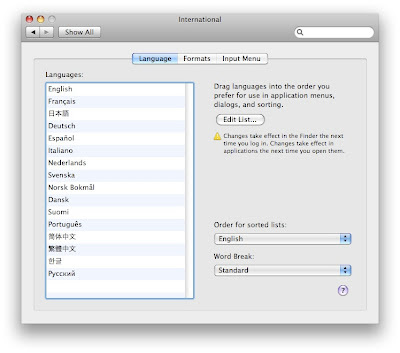 Temporarily changing the language of your OS! 3. Drag the language you want your operating system to use to the top of the list. The change will only take effect when you restart your Mac. When you have the right preferences selected, Safari can auto fill passwords and a lot more information. It happens that the info just doesn't appear or it only appears when the page is fully loaded. To make things go faster, you can use the menu option "AutoFill Form". It is even possible to bring it up with the shortcut "Shift - Command - A". Exposé and dashboard during a Keynote presentation! There is a great feature that you can enable in Keynote that will enable Exposé and Dashboard while a presentation is running. 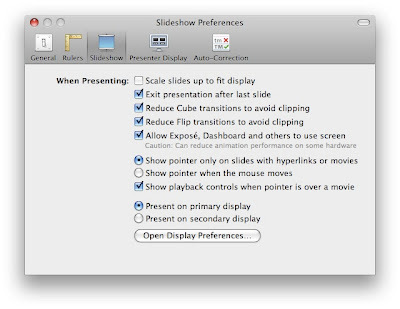 It is in the Keynote preferences, under "Slideshow". You can now switch to another application during a presentation and when you switch back to Keynote, it will resume exactly where you left off. It is also possible to use this to refer to a Wikipedia article in dashboard without interrupting anything. If you get a video file that includes black bars at the left and the right or at the top and the bottom that doesn't match the aspect ratio of your display, you'll end up with black bars on every side when you go full screen. Video really shouldn't be encoded this way because the computer is totally capable of adding the black bars according to the aspect ratio of your display. It is however possible to make the video watchable. 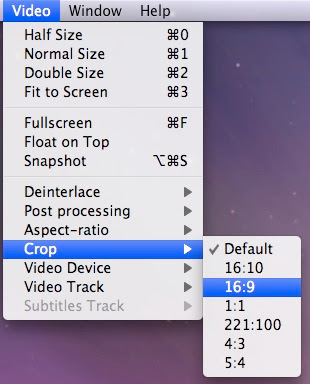 Using VLC, you can crop the video on the fly to any other aspect ratio. If you choose the right one, it should remove only what needs to be removed. 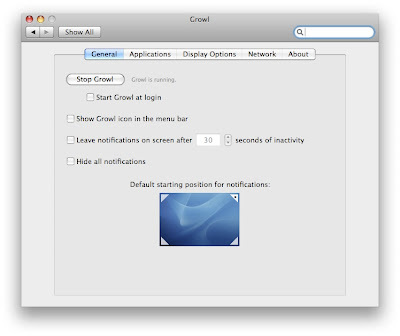 Growl is a free notification system for Mac OS X. It is extremely customizable and it is compatible with many different freewares and sharewares. It incorporates very well with Mac OS X and there are many different display styles. I find it very useful because FTP transfers take a while and I always do other stuff while it is copying. With Growl, as soon as it is done, I get a notification. A kind of notification that I can't stand is an icon bouncing in the Dock. The problem with the bouncing icon is that it interrupts my workflow, because I have to switch back to this application to stop it from bouncing. The Growl notifications disappears after a few seconds so I don't have to take care of it right away, but at least I know about it instantly. I find it is mostly useful with chat and FTP applications. I use it with Adium, Chax, ForkLift, Handbrake, Skype and Transmit. Once you start paying attention to the list of application that use Growl, you'll find a lot. You can download Growl here from MacUpdate. From your browser history to your bookmarks! When you click on the open book that is at the left of the bookmark bar in Safari, you get the whole list of bookmarks. There is also a section in there for the History. I never really realized it was there and I only used the History menu. It can be useful for something completely different though. If there is a URL in your history that you would like to bookmark, instead of loading the website and going to "Bookmark this site", you can simply find it in this History section and drag it right over to the Bookmarks. It is that simple and it will even work offline. The To Do from Mail in the dashboard! I am not really sure why Apple didn't include something like this with Leopard. The To Do in Mail are nice, but I think there are just not separated enough. 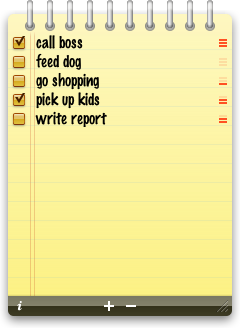 The widget called "To Do Widget" gives you a very polished interface for managing the to do from Mail. You can do everything from within the widget, even editing. It is a free download here from the developer's website. Transferring emails to another mail client! This is actually a simple way of transferring a few emails from one computer to another or from Mail to another application. It will also let you preview the file in Quick Look (it doesn't work well in a text editor). A lot of cool things can be done by simply dragging things around in OS X and the same is true with Mail. You can easily drag an email from Mail to the desktop or any Finder window. It will then be readable with Quick Look or just by reimporting it in any mail application. Getting the highest quality in screen sharing! In the Screen Sharing View menu, there are two possibilities, "Adaptive Quality" or "Full Quality". I was on Adaptive Quality by default and I left it there for a while because it means that it is supposed to adapt to the quantity of bandwidth available. The quality of the image I was getting was far from perfect however. I assume it was because my network was not fast enough. After a while, I took the time of trying "Full Quality". The improvement was incredible. Best of all, on a fast wireless n network like I have, there was no lag! So if you are on a fast network, switching to Full Quality is a great improvement. Adding to iPhoto from the Finder! One cool feature of Quick Look that wasn't really covered much is the possibility of browsing through photos in the Finder and simply clicking the "Add to iPhoto" button in Quick Look. 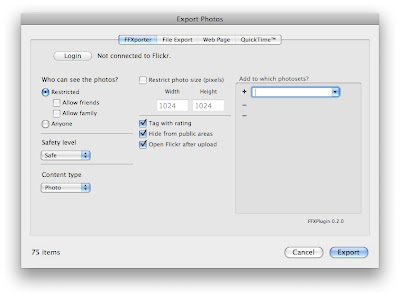 It will automatically launch iPhoto and import the photo in a new event. It unfortunately doesn't work when multiple photos are selected so it really doesn't make it a batch importing tool. It can still be quick if you have a screenshot that you want to retouch in iPhoto or just a simple picture that you want to import. Open Recent in Word 08! 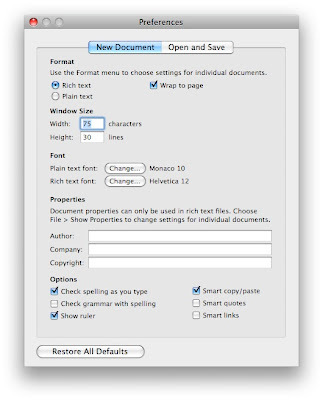 Word 2008 is a huge improvement over Word 2004 and it is not only because it is finally native on Intel Macs. There are loads of small but really cool new features. This one lets you access the "Open Recent" menu by clicking and holding on the Word icon. It only works when Word is already open, but it can still be a great time saver. Shortcuts for mailboxes in Mail! 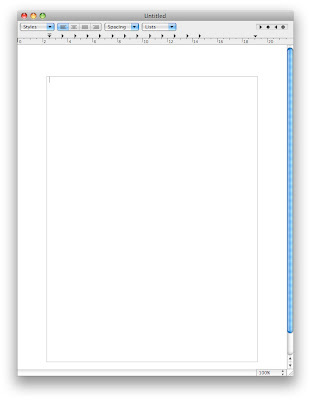 When a dialog box pops up in applications such as Safari, the shortcut is usually pretty obvious. "Enter" will be "OK" and "Esc" will be "Cancel". But, it does happen that some dialog boxes don't have the obvious OK and Cancel. One that annoys me in particular is the one to remember my password. I nearly always want to click "Not Now", but there is no obvious way of doing that. Even for that, the Esc shortcut works. In this case, there are three options, so you'll have to try it once to see which option will "Esc" do for different dialog boxes. It didn't make sense to me at first, because I always see Esc as a way of stopping a web page from loading, but it is really useful when you start using it. Using your built-in portable motion sensor for a game! I think this is a very innovative way of building a game. 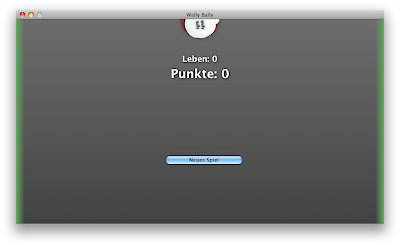 The game called Wally Bally uses the motion sensor that is built-in to every new portable Mac as controls for the game. The game is very simple, but I think it is more about the concept than the real game experience. I was surprised how precise the motion sensor is, because I know Apple only added this to protect the hard drive in case of a fall. The developer says it works on MacBook, but I assume it also includes MacBook Pro and PowerBook that have the motion sensor. The game unfortunately does require Mac OS X Leopard. The game is not in English, but it really doesn't matter. You can check it out here on MacUpdate. New controls in iMovie '08! I also just want to remind everyone that tomorrow is the MacWorld Expo Keynote with Steve Jobs, so some great fun tomorrow with new products and maybe even new software. Viewing folders within Quick Look! You can get more info and download the plugin here (link to Flickr because the developer's site is not in English). Thanks for the tip Nessuno! 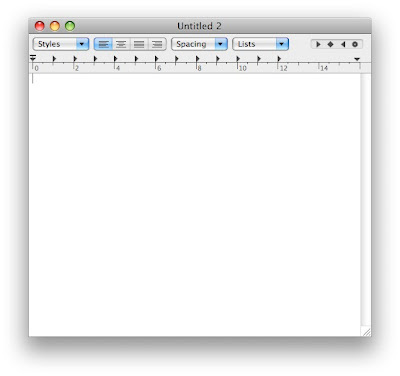 Can TextEdit actually look like a real word processor? 1. 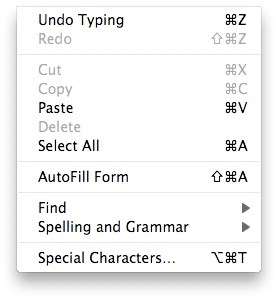 Go to TextEdit and choose Preferences. 2. Check "Wrap to page". 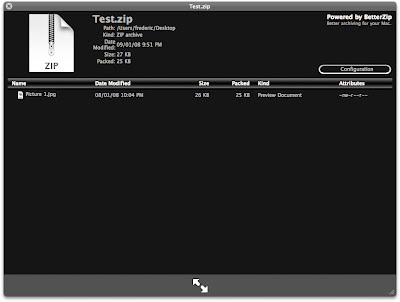 Viewing archived files within Quick Look! The formats supported by this plugin are ZIP, TAR, GZip, BZip2, ARJ, LZH, ISO, CHM, CAB, CPIO, RAR, 7-Zip, DEB, RPM, StuffIt's SIT, DiskDoubler, BinHex, and MacBinary. Thanks for the tip Nessuno! Reopening a window closed accidently! I often work fast, especially with keyboard shortcuts so it happens often that I accidently close a window of the web browser. It is of course possible to simply reopen it from the History. Unfortunately, the one that I closed is not always at the top of the history. It might be a page that I loaded an hour ago. There is a very cool feature in Safari that reopens the last closed window. If the last closed window had several tabs, it will reopen all the tabs (although it is unlikely to close a window with many tabs because Safari warns you first). 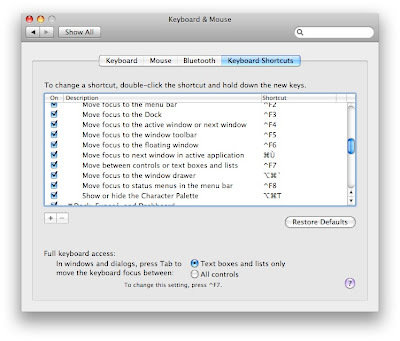 There is no keyboard shortcut assigned but you can create one in System Preferences (check previous tips). 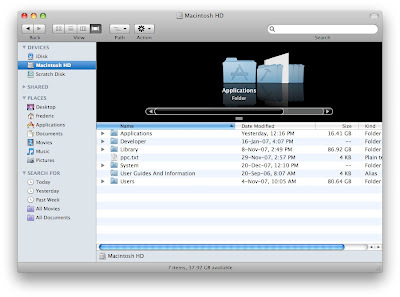 The feature is located in the "History" menu of Safari and is called "Reopen Last Closed Window". Searching through compressed files with Spotlight! Spotlight lacks one feature and it is the possibility of searching through compressed files such as .zip. There is a great free plugin that solves this problem. It is called Ziplight Spotlight Plugin 1.2. What is great about it is that once it is installed, you don't even know it's there. You can continue using the same Spotlight menu as before. The only difference is that zipped files will appear in the result and it won't only be because of the title, but because of what is inside. You can learn more or download Ziplight Spotlight Plugin here from MacUpdate. I often leave my web browser open just because I have some web pages open that I want to check out later. Bookmarking them one by one is not really an option. There is a way to save what is open in bulk. 1. In Safari 3.0, go to "Bookmarks" and choose "Add Bookmark For These 3 Tabs...". 2. Name the bookmark and save it. It will create a folder with a bookmark for each tab that you have open. If you later want to reopen them all at once, click on the bookmark folder and choose "Open in tabs". A great tip submitted by megas88: Displaying names in Exposé! This works with Leopard and might work with Tiger (I haven't tested it). This is another cool unknown shortcut in Exposé. When you bring up Exposé and you mouse over a window, the name is displayed. If you press "Option" when Exposé is loaded, the names of all the windows will be displayed. Thanks for the tip megas88! 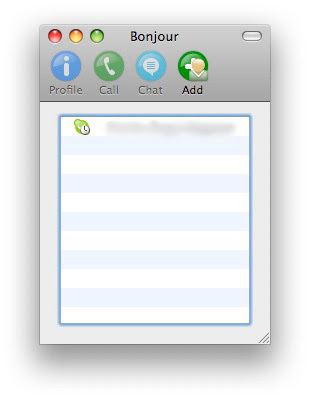 VoIP on a local network! 4. That's it! Skype will open a new window with a list of contacts that are currently online, but that are also on your local network (and also have Skype Bonjour enabled). 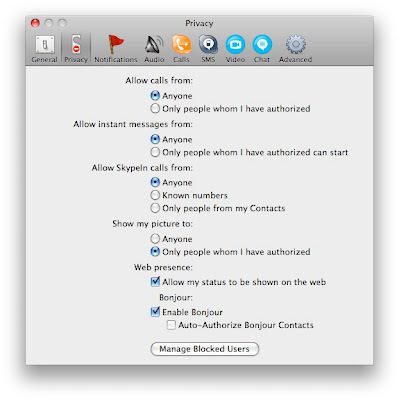 Another interesting option is "Auto-Authorize Bonjour Contacts". It can be useful when you know you don't mind if anyone on your LAN wants to be a contact. It is particularly useful in a business environment. 2. Click on Keyboard & Mouse. 3. Click on the Keyboard Shortcuts tab. 4. Scroll down to "Move focus to next window in active application". 5. Change the shortcut back to what you were using. It depends on what language you are using for your keyboard layout (it was "Commmand - Ù" for the French keyboard). Don't forget to check out the tip posted earlier today! Exporting from iPhoto to Flickr! 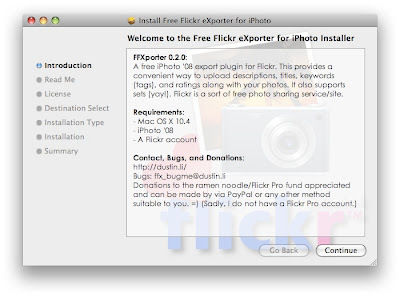 I had seen many commercial solutions that added Flickr export to iPhoto in the past, but this one is the first free one I found. It is only compatible with iPhoto '08. 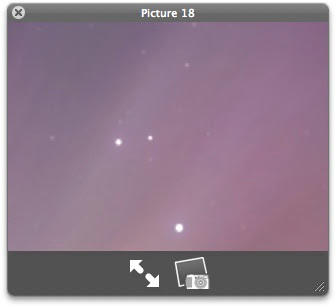 It is similar to the Facebook iPhoto Exporter. Once it is installed, you simply have to select the photos in your library and go to File, Export. The installer adds a new tab called FFXporter. The login is done in a web browser. You can check it out and download it here from MacUpdate. Solving Quick Look issues with a Leopard upgrade! 1. 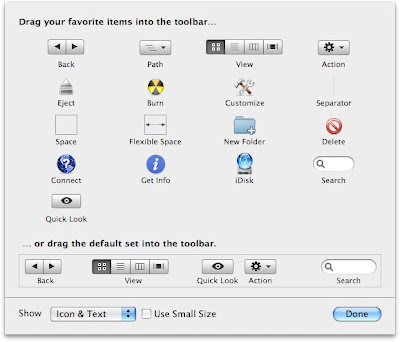 In any Finder window, right-click on the toolbar and choose "Customize Toolbar...". 2. 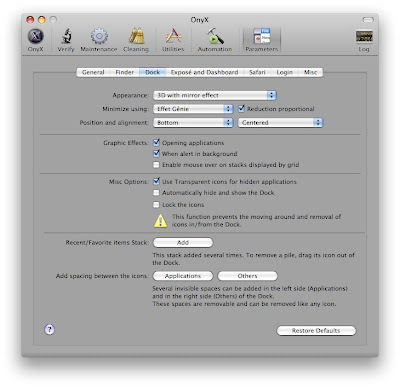 Drag the Quick Look icon or simply the default toolbar. 3. That's it! You now have two ways of bringing up Quick Look. 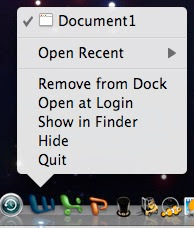 The "Command - H" or Hide a certain application feature is very useful to keep a lot of stuff open without clutter. It is however not easy to quickly see what is hidden. There is a great feature that you can enable that will make every icon of a hidden application in the Dock semi-transparent. You can then quickly spot which applications are hidden. The easiest way to enable this feature is with the free third-party application called OnyX. It was just recently updated to work on both Tiger and Leopard. You can download OnyX here from MacUpdate. 1. Open OnyX and click on the Parameters tab. 2. Click on the "Dock" tab. 3. Check "Use Transparent icons for hidden applications". Applying iPhoto effects in batch! Batch processing can really speed things up and it is the main reason why applications such as Automator are so great. iPhoto doesn't have any kind of batch processing capabilities, especially when it comes to editing photos. Being able to apply effects such as Enhance, Black and White, Sepia, etc, to a bunch of photos at once could be really helpful. There is a free third-party application that solves this. It is not a plugin, but a standalone application. To use it, you simply select the photos in iPhoto and switch to the application called iPhoto Batch Enhancer. You choose the settings in the app and click "Apply". You can download iPhoto Batch Enhancer here from MacUpdate. Transferring playlists from one Mac to another! 1. 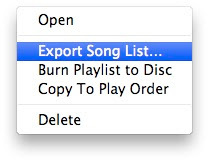 Right-click on the playlist you want to copy and choose "Export Song List..."
2. Use the XML file format and save the file. 3. Transfer it to the other Mac and open iTunes. 4. Go to file and choose "Import...". 5. Import the XML file. 6. The playlist should be created with exactly what you had on the other Mac. The links to the new path of the songs should work instantly. I am not sure if it would work with songs that don't have the exact same metadata from one Mac to the other. It worked great with podcasts and songs from the iTunes store and it really should be fine with every other songs (especially if the music on your laptop was copied from your desktop originally). Giving a direct link to something on the iTunes store! If you want to tell someone about a podcast, song, tv show, movie or anything on the iTunes store, you can use the "Tell a Friend" link from Apple that is everywhere on the iTunes store. 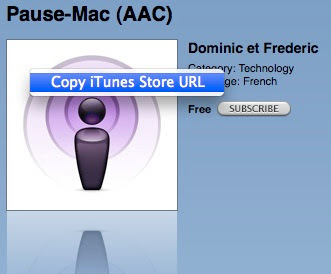 If you don't want to go through Apple and prefer sending a simple and direct link, you can get the link by right-clicking on the artwork and choosing "Copy iTunes Store URL". The link can then be pasted in any web browser. The browser should ask if you want to load iTunes and once you say yes, it will automatically load the iTunes store at precisely the right location.